Jay Holben’s new DIY lighting manual hits bookstores! Our dear friend, fellow filmmaker and resident cinematography guru JAY HOLBEN has written what is sure to become an essential primer for everyone shooting no/lo-budget video productions. A SHOT IN THE DARK: A Creative DIY Guide to Digital Video Lighting on (Almost) No Budget gives filmmakers the tools and steps to create a lighting arsenal to handle a multitude of situations. 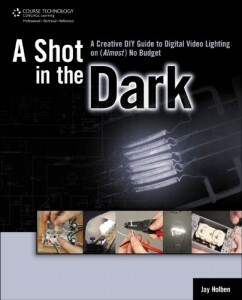 The manual lays out tips and techniques, as well as hand-on projects and instructions on how to create lighting tools from inexpensive, readily available resources. Jay’s ability to take extremely technical details and find a way to make it accessible makes this book a real gift. “I’ve been teaching for years. 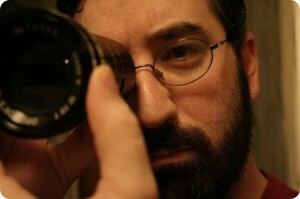 Lectures, seminars, articles… I thought I really knew how to impart information,” Jay continues. “But technical editor Jayson Crothers pushed me to really expand the scope of what I was teaching and covering it became a challenge of how much information we can cover in a small space, and yet relate to the audience. I tried to break down the information so that anyone and everyone could learn and improve based on my years on set, through both my mistakes and successes. A SHOT IN THE DARK is part Lighting 101, two parts Bob Avila, and a smidge of McGuyver. Bottom line – it is the perfect time for this book. Final Cut Pro and the advent of video cameras propelled filmmakers to break down the barriers between creativity and technical knowledge. This manual opens another massive door to a critical component of filmmaking that will empower storytellers of every experience level.